Administration rights are required to uninstall a Single-User License. Then, you may transfer the license to a different computer. In µVision, open the Single-User License page of the File — License Management... dialog. Select the product you want to uninstall from the list. Click on the Uninstall... button and select Yes to the prompt. Your original license ID code (LIC) has been replaced by an Uninstall License ID Code starting with TRN. µVision opens a webpage on the Keil website and automatically enters this TRN number. You must click on the Submit button to finalize the uninstall process. 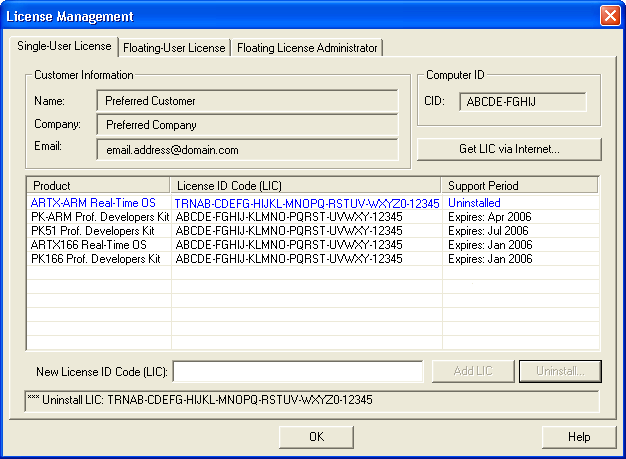 Write down the Uninstall License ID Code starting with TRN from the License Management dialog as shown in the figure. and enter the Uninstall License ID Code that starts with TRN. After uninstalling a license, you may obtain a new LIC on a different computer for the software product.